CHF 30.- OFF for a big flight with "Les Ailes du St-Bernard"
The highest areas in the Pays du St-Bernard are the most beautiful! 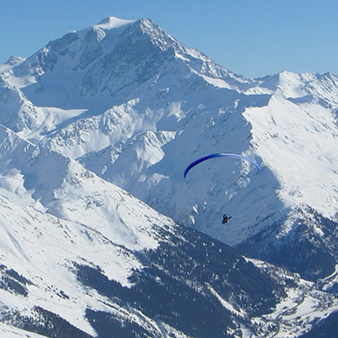 Solo and tandem paragliding are available for all so get yourself some wings and discover our beautiful region. Professionals are available throughout the year for flights from La Breya, Six-Blanc, Bavon or other places depending on conditions. 40% on your order at Suisse Itinérance. Our co-working space is all about a warm welcome, creative exchanges and professional tools. Centrally located in the Châtelard district of Orsières, near the village train station and the Edelweiss car park, Le Bureau offers you access to WiFi, a locker, a printer and a computer if required. Annual free access to the ski resorts of Vichères-Liddes, La Fouly, Champex-Lac and BourgSt-Pierre (La Lorette). Enjoy time out in any weather at the indoor pool heated to 29°C at Bourg-St-Pierre. A fascinating world, in the heart of the mountains with a strange atmosphere – a hidden fortress under the Alps. Champex-Lac Artillery Fort constitutes a central pillar of the fortifications in the Grand-Saint-Bernard region. Ice climbing in Champex-Lac: a 16m ice pyramid is at your disposal at the place des Forts next to the skating rink. Skating on the frozen lake : Conditions permitting, Champex also offers hours of entertainment on the flat surface of the frozen lake for free skating. Fondation Gianadda in Martigny is an internationally renowned cultural foundation with multi-faceted aspects. The museum offerings range from archaeological exhibits, a vintage car and sculpture park to art collections and concerts. The lively museum located in a former armoury next to the Roman amphitheatre is a meeting place that brings together people and the Saint Bernards from the Great Saint Bernard pass. 50% on the train line Martigny-Châtelard only in winter. 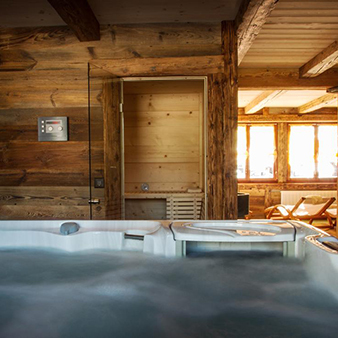 What could be better than a moment of relaxation in a spa of 93m2 with jacuzzi, hammam and sauna? - Free access to the chairlifts of La Fouly and Champex-Lac during the summer season. To save you the drag of the uphill, you can choose to have your bike taken up for free by the ski-lift company. Go down the slope in Champex-Lac or La Fouly with our scooters. Live an extraordinary experience with your family or friends ! The Flore-Alpe botanical garden is a captivating space situated at an altitude of 1500 meters in a magnificent alpine decor. The path now has three routes with 40 stations and 10 zip lines. The open air pool at Champex-Lac is heated to 27° and has a snack bar with light refreshments, a badminton court, tennis court, beach volleyball, ping pong table, a petanque court and a slackline. Guaranteed fun for all, pedal boats or stand up paddle can be hired from the hut next to the lake for an interlude surrounded by a magnificent, peaceful landscape. Limited to an half hour per day. Classified among the ten more beautiful Gorges in Europe, the Gorges of Durnand offers a breath taking scenic sight. Footbridges and overhanging wooden staircases looking over 14 torrent cascades invite the walkers to live an unforgettable experience. Visit the Grand-Saint-Bernard Hospice Museum with access to the breeding establishment ofthe famous dogs in the place from which they originate, today entrusted to the Fondation Barry. Booking is mandatory, even with your PASS Saint-Bernard. Key are available at the Buffet-restaurant de la Gare, Café-Restaurant l'Atelier, 3 Dranses, Prairie, Café Helvetia or at the railway station of Orsières on presentation of your PASS. Botanical garden La Linnaea in Bourg-St-Pierre : Located at Bourg-St-Pierre, La Linnaea is an Alpine garden and biology station which has belonged to the Geneva Academic Society since 1915..
Valsorey Mill in Bourg-St-Pierre :Built in 1681 and located in the vicinity of the ancient village of Bourg-St-Pierre, Valsorey Mill is located below the route taken by the Saracens, the Romans, Charlemagne’s soldiers and Napoleon Bonaparte’s troops. Climbwall in La Fouly: Beginners on their part can cut their teeth on the outdoor wall designed for learning and located at La Fouly. 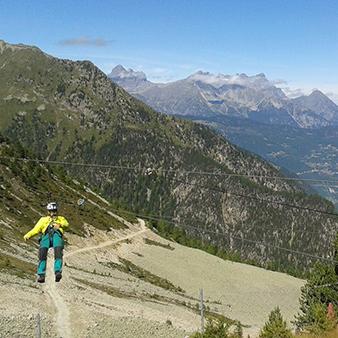 TeleLaFouly-ChampexLac offers you 2 new zip lines at the upper station of La Breya chairlift at 2200 metres. With 540 and 520 metres, they are the longest zip lines of western Switzerland ! 50% discount on the ride « VerticAlp Emosson ». Discover the origin of the Sel des Alpes, as a family day out, on a school trip, on a corporate outing or with friends. The entrance to the Trient gorge is at Vernayaz, very near the railway station where the Mont-Blanc Express stops. The gorge forms a 200-metre-deep natural cutting in the rock. An educational trail uses audiovisual media to tell you all about its geological features, history, and wildlife. Perched above St-Maurice, a city in the Valais which is abundant in cultural and historical riches, the Fairy’s Cave (Grotte aux Fées) dominates the Rhone Valley.